We just received this customer testimonial, which was received from a car body repairer. The customer contacted FundInvoice on a Friday, and received an invoice finance payout, against invoices to car insurance companies, on the following Tuesday. A very fast turnaround of just 3 working days from first contact to funds received. 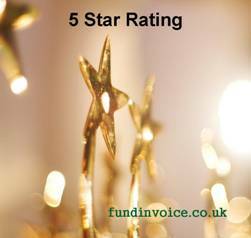 They gave FundInvoice's invoice finance quotation search service a 5 star rating, out of a possible 5 stars. This means our average customer rating remains 4.9 stars out of a possible 5 across the reviews that our customers have given as at the time of writing. "We are quite happy to give you 5 stars :) You have been communicating efficiently and looking after our needs with regards to [THE INVOICE FINANCIER]. All the best and thank you for your referral." This is a great testimonial that reflects how simple and straightforward this product is. The car crash repairer can access funding in a very short timescale, in the case of this customer is was 3 working days end-to-end, but our record (so far) was just 7 hours between first contact and funding being received. The process is very straightforward, without the need for debentures over your company, or personal guarantees (you just undertake not to commit fraud). You can read more about How Body Shop Finance Works And The Costs on the section of our site dedicated to specialist funding for the car crash repair sector. Find Funding For A Car Repairer Working For Insurance Companies. How Does Invoice Finance For Car Crash Repairs Work?